What’s so cool about selling crack? How do know when she’s the one? How would you feel if your son told you he was gay? Do you really feel free? What does it mean to have a black president? What’s it like to watch someone lose their life? 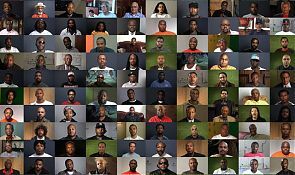 These are just some of the 135 questions that compose “Question Bridge: Black Males,” a transmedia project undertaken by artists Hank Willis Thomas, Chris Johnson, Bayeté Ross-Smith, and Kamal Sinclair. Over the past four years, the team has traveled to 11 cities between Birmingham and San Francisco to gather video footage of self-identified black men answering and asking questions posed to each other. The organizers merely act as facilitators for a technologically mediated conversation that takes place between men of all ages, economic positions, and geographic locations. 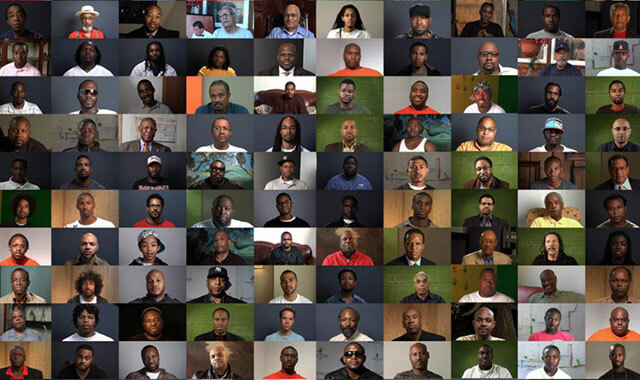 While the footage was originally intended to result in an hour-long documentary, the team soon realized that the collected 1,600 question-and-answer exchanges between 160 African American men needed to be something bigger. Thomas proposed that they reimagine the footage as a three-hour, five-channel video installation that they ended up launching in five cities concurrently. “Question Bridge: Black Males” debuted in January 2012 at the Sundance Film Festival, the Brooklyn Museum, the Oakland Museum of California, Utah Museum of Contemporary Art, and the Chastain Arts Center in Atlanta. “What started off as ‘Oh we’re going to do a documentary’ became a campaign to represent and redefine black male identity,” Thomas told ARTINFO. The scope of the “Question Bridge” campaign, however, reaches far beyond the confines of a video installation presented at a museum or a festival. The project has also become a free school curriculum for grades 9-12 that allows students to create their own question bridges, live events and dialogues, and now “Question Bridge” is undertaking a Kickstarter campaign to raise funds to create an interactive website and mobile app that they hope will rapidly expand the number and range of participants in the project. Sinclair, for one, has proposed that they should aim to get 200,000 African American males — one percent of the black male population of the U.S. — to come to the website to ask and answer each other’s questions. As the project sets out to prove, there certainly is not. According to Thomas, a single question hardly ever provoked the same response. The candid responses to a question like, “What do black men have in common?” range from poignant to comic. The “Question Bridge” website is planned to launch in January 2014 in L.A. with a four pronged attack. They will have the curriculum in schools, the installations in museums, round table discussions, and street teams with iPads and mobile devices to get people onto the website. They currently have 160 participants and are hoping to launch with 200 people and 300 questions. Currently, the project is on view at the Milwaukee Art Museum, the Missouri History Museum, and the Exploratorium in San Francisco, and it will open at Jack Shainman Gallery in Chelsea on July 11. Thomas hopes that the success of the inaugural black males version of the project will cause people to create question bridges about any type of identity label. “It’s our goal to create this diverse, dynamic conversation and forget about the back males part and think about the humanity part.” Not a bad goal.